How intensely do you pursue business innovation? Are you relentless about it? Do you find opportunities for innovation in extreme places? The article below, titled "Extreme Foreignness, Innovation & Execution", was my contribution to the 2010 edition of Age of Conversation, a collaborative book series which brought together bloggers from around the world who each contributed one chapter. 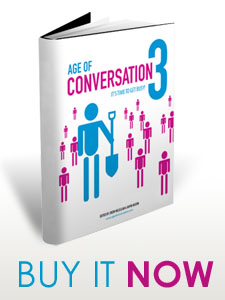 [See Age of Conversation 3: It's Time To Get Busy! for more perspective.] It focuses on innovation in business and the benefits that come from embracing the intensity and 'foreignness' of the experience through conversation. My nephew, Sean B. Sullivan, inspired the article. At the time, he was living in Tokyo, surrounded by foreignness, learning intensely. Have you had a similar situation? Opportunities for innovation surround us. Yet, we don’t always recognize them. Why not? I believe because we shut ourselves off from them. Some of it has to do with so much doom and gloom that we’ve squashed our intellectual curiosity; some, with not having figured out how to manage the information chaos both personally and corporately; and some, with not being sure how to explore, experiment and exchange ideas. How to stop shutting out innovation? Imagine that you are American and have been sent on assignment toTokyo. You may admire Japanese culture, but you can neither speak the language nor read Kanji. What then? Will you opt to seek out others just like you, perhaps through the American Consulate? Will you limit interactions to fellow Ex-Pats, live within an American compound, send your children to American school and do your best to purchase only American-like foods? Or, will you open yourself to full foreign immersion: walk the streets, listen for patterns, observe body language, go to local Yakitori BBQ joints and ride the subway? Take Japanese language classes and find bilingual sherpas with whom to bridge the cultural and language barriers and engage in conversation to make sense of the differences? Pretty soon, you reach a point where you are able to participate fully in the experience and are already considering new integrated approaches. I equate innovation with the experience of extreme foreignness. Not that you have to go all the way toTokyo. Rather, by opening yourself up to conversation and the variety of perspectives that conversation uncovers, you open the door to innovation – to hearing about customer frustrations and suggestions for improvement. That’s what Fiskars has done with its brand ambassadors, the Fiskateers, who provide feedback on products and obtain insights from retailers and consumers. Conversation can also help ensure better execution. Take Wiggly Wigglers and its crowdsourced catalog. What better way to engage customers and community by executing as a result of conversation-based innovation! The best part of these types of conversation based innovations is that they lead to continuous improvement; to small successes that build one on the other and that enable you to rapidly become fluent in what one was a total foreign language and culture. Are you ready for a dose of extreme foreignness?